Over 80,000 people are expected to arrive in Austin over the next week for the mesquite-scented, queso-chugging festival SXSW—including the president of the US, who will be delivering the keynote for the tech portion of the nerd circus today. 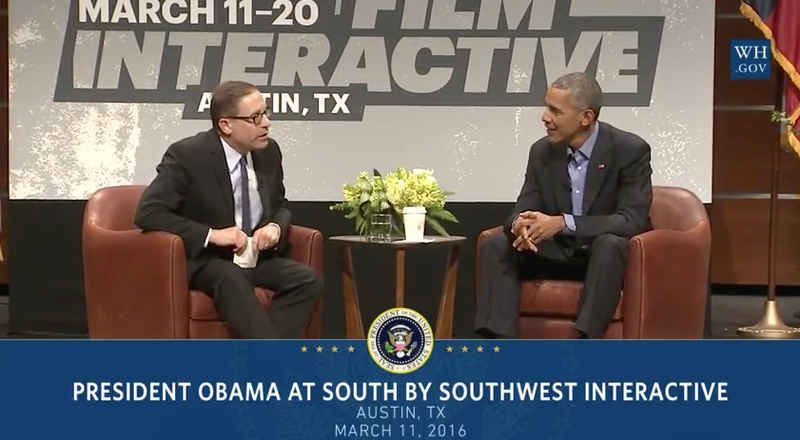 And you can watch President Obama in conversation with Texas Tribune editor-in-chief Evan Smith right here, starting at 3:30 pm ET/2:30 pm CT.
Obama’s the first in a string of civic leaders who will be appearing at SXSW, including Secretary of Transportation Anthony Foxx, and a whole bunch of US mayors. Here’s the entire livestream schedule. Reportedly Obama will be discussing civic engagement, including ways the US government is using open data and other tech tools to address issues like immigration, social equity, and climate change. He’s already announced two of these programs: The Opportunity Project and TechHire Initiative.